The Total Quality Management (TQM) diagrams visualize business and industrial processes. 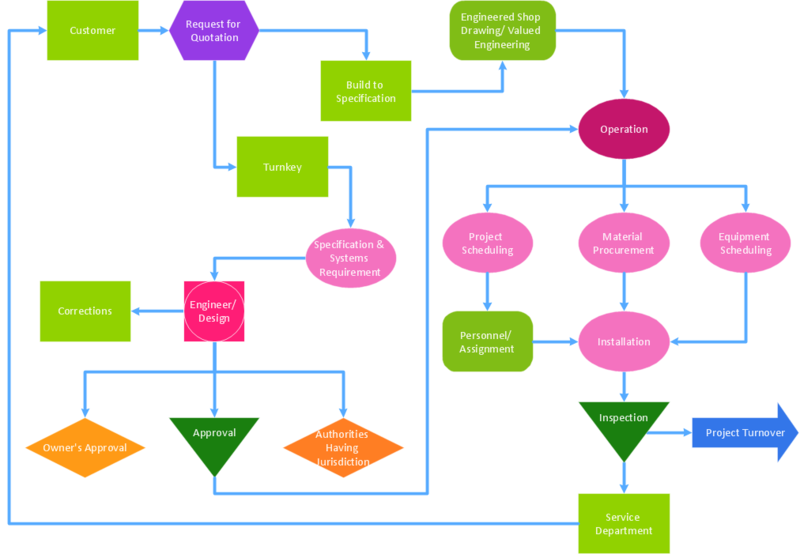 TQM diagram helps to show clearly step-by-step process and to compare the ideal and real process stages visually. This example shows a business process Total Quality Management diagram that can be then analyzed for ways to improve the process effectiveness and diagnose quality issues that require resolution. Quality Control Chart Software (ISO Flowcharting) - ConceptDraw DIAGRAM v12 extended with Total Quality Management TQM Diagrams Solution from the Quality Area is the best diagramming and vector drawing software that allows you to draw the quality control charts quick and easy. The quality control chart is a graphic that illustrates the accordance of processes or products to the intended specifications and degree of differences from them. Depending on what type of data you need analyze, there are used different types of quality control charts: X-bar charts, S charts, Np charts.